A clutch of former confidantes of John Fredriksen have come together to make a big splash in the drilling sector. Borr Drilling, formerly Magni Drilling, yesterday completed its $155m equity issue in Oslo at $2 a share. The proceeds from the placement will be used to finance the acquisition of two modern jack-ups rigs from Hercules Offshore, the Hercules Resilience and Hercules Triumph. The two rigs are costing $130m. “Borr Drilling’s ambition is to acquire and operate modern drilling assets purchased at a significant discount to the newbuild cost price,” the company said in a release. Rune Magnus Lundetræ yesterday was appointed ceo of Borr. Lundetræ was formerly CFO at Fredriksen’s Seadrill. Another Seadrill senior exec, Svend Anton Maier, has also been poached to become Borr’s coo. Among Borr’s directors is Tor Olav Troim (pictured, right), formerly Fredriksen’s right hand man for many of the tycoon’s businesses. 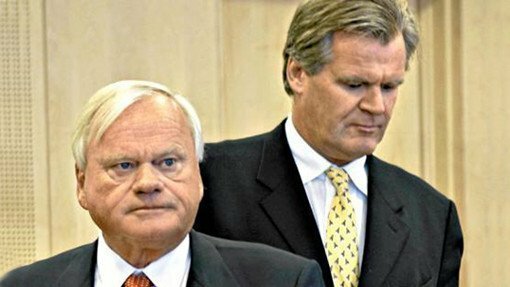 Troim and Fredriksen severed ties a couple of years ago. “Through the acquisition of the two Super A class jack-ups, we have executed a very attractive entry into the drilling industry at close to historical low valuations. We believe Borr Drilling can serve as an effective operational platform to further drive and execute distressed asset investments to capitalise on the low assets prices and continued volatility in the offshore industry,” Lundetræ commented. Borr is old Norse for son as well as a significant character in Norse mythology.